Because of the size and weight of this item, it cannot be shipped First Class. If ordering in the U.S., please chose Priority mail during Checkout. Moving into the majestic realm of pure, non-rhythmic electro-acoustic soundworlds, Mystic Chords & Sacred Spaces is a stunning 4-CD release marking a new milestone in Roach’s history as a true artist of sound. His landmark statements – including Dreamtime Return, Magnificent Void and Structures from Silence – are all parts of the uninterrupted flow building to this release. After a recent run of rhythmically fused CDs, Roach moves into awe-inspiring sonic immersion, delving into a spiritual dimension of sound. Nearly 5 years in the making, this release offers a listening experience beyond entertainment and pop culture appeals, creating a new sense of ‘ambient orchestration’ through a constantly shifting flow of sounds and textures that enters a sacred realm of music. 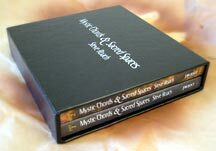 Disc 1: Mystic Chords & Sacred Spaces … The sacred and divine aspects of sound are the heart and soul of these five innerconnected pieces. Disc 2: Labyrinth … The path through the labyrinth is one of choices and consequences. These nine soundworlds were drawn from the metaphor of the labyrinth and the passing from one ring to the next, reaching the center. Disc 3: Recent Future … Time, memory, reflection, future dreamings and the places in between are the broth of life from which these pieces are poured. Disc 4: Piece of Infinity … It’s always there, this piece of infinity. A single longform space. The Box is now out of print. We sold through 1000 of these in the two months leading up to street date.